The Summit Awards is the premier annual event that recognizes the success of distinguished commercial agents, brokers, developers, property managers as well as commercial projects in the Northern Nevada region. The 135-room, non-smoking, non-gaming hotel opened August 2016. The new state-of-the-art lobby at Courtyard provides greater flexibility and choices for its guests. At the center of it all is The Bistro, a destination for a great breakfast, or drinks and dinner during the evening. The Courtyard also provides flexible spaces where guests can work or relax, free Wi-Fi throughout. The hotel also features a well-equipped fitness center, indoor pool and whirlpool. The new hotel was built on the former dilapidated Nevada Inn. It is located in downtown Reno across the street from Greater Nevada Field and right on the Truckee River. 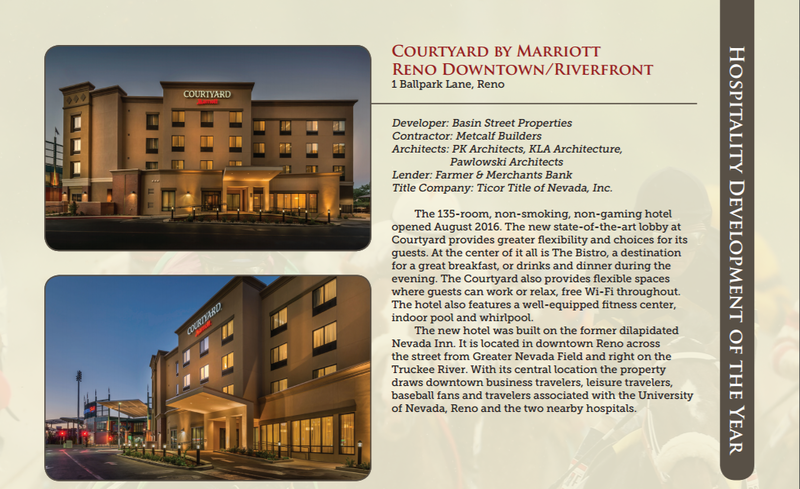 With its central location the property draws downtown business travelers, leisure travelers, baseball fans and travelers associated with the University of Nevada, Reno and the two nearby hospitals.